American Eagle Outfitters continues to post comparable-sales growth. Can this cheaply valued company continue to please investors? Last year, shares of American Eagle Outfitters, Inc. (NYSE:AEO) rebounded from their poor 2016 performance, with investors bidding up shares of the company 24% in 2017, according to data provided by S&P Global Market Intelligence. American Eagle investors were impressed with the company's continued strong financial performance, which includes 11 consecutive quarters of comparable-sales growth. American Eagle Outfitters' comparable-sales success is due to the company's Aerie lingerie brand. Last quarter, the Aerie brand posted a comparable-store increase of 19%. Through October, Aerie was growing year-to-date comps at a 23% rate, only slightly below the 25% it posted in the prior-year's comparable period. The teen-friendly clothing brand shook off concerns that have plagued other retailers, particularly mall-based apparel retailers. Unfortunately, there's a cost associated with the increases in comparable sales: falling margins. In the last three quarters, American Eagle has seen its gross profit margin fall on a year-on-year basis, as increased promotions and higher shipping costs are rising faster than revenue. Dollar figures in millions. Data source: American Eagle Outfitters. Operating margin, which includes sales, general, and administrative costs, has endured year-on-year decreases for four consecutive quarters. One encouraging sign for operating income is that margin loss appears to be narrowing. In the quarter ended January 2017, operating income percentage decreased 260 basis points on a year-on-year basis -- 7.8% versus 10.5%. In the quarter ended September 2017, the operating margin decreased approximately 90 basis points. Even considering American Eagle Outfitters' strong 2017 performance, the company is still cheaply valued. Shares of the company now trade hands at approximately 14 times forward earnings. 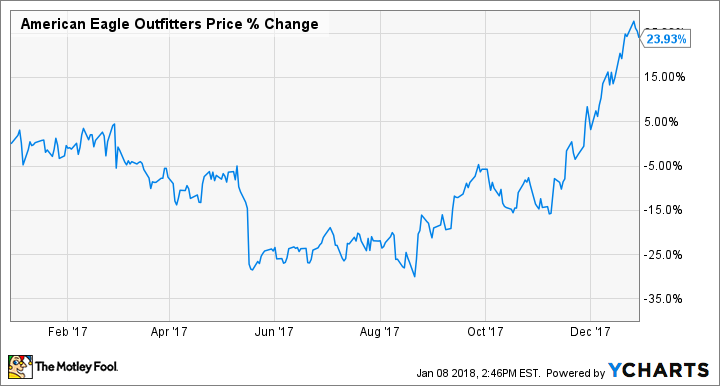 Compared to the S&P 500's forward price-to-earnings ratio of 19, American Eagle Outfitters should be able to build upon 2017's stock rally if the company can continue to post comparable-store growth and reverse its operation margin declines.